Applied before the Liss Unlimited Lissceutic Masque, this exclusive in-salon hair oil is the ultimate anti-frizz treatment. 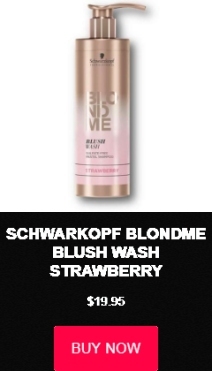 Leaves hair shinier and smoother to the touch. The hair is nourished, and smoothing is optimized. 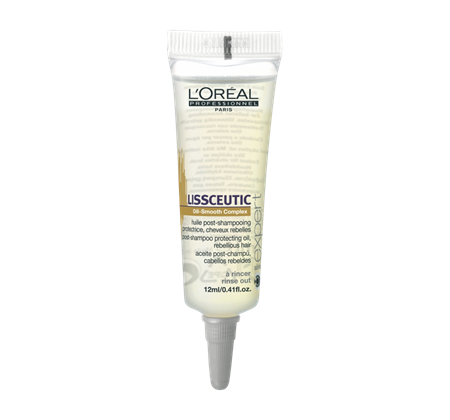 Click here to find out more about LISS UNLIMITED After-shampoo protecting oil on the Official L’Oreal Professionnel Website. With the Liss Unlimited Smoothing Cream offered exclusively in L’Oréal Professionnel salons, you’ll experience a unique blow-drying treatment leaving your frizzy and rebellious hair silky smooth and protected, with a long-lasting anti-frizz effect of up to 4 days. 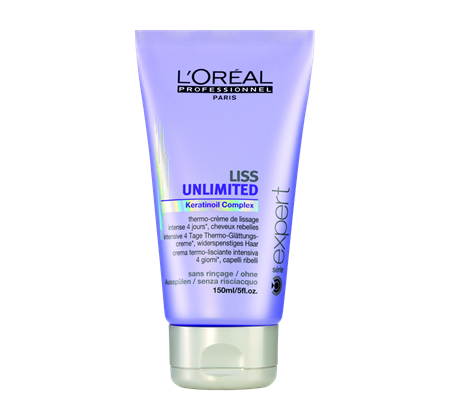 Click here to find out more about LISS UNLIMITED Smoothing cream on the Official L’Oreal Professionnel Website. The Liss Unlimited SOS Smoothing Double Serum by L’Oréal Professionnel is designed to give you up to 4 days protection from frizzy hair and fly-aways. 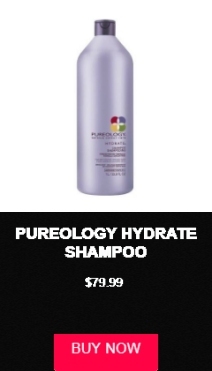 With a formula enriched with Pro-Keratin and Evening Primrose Oils, which work to give the hair a sleek and softened finish, and Kukui Nut Oil – known for its humidity-blocking qualities. Click here to find out more about LISS UNLIMITED Double Serum on the Official L’Oreal Professionnel Website. This luscious smoothing hair mask nourishes, smoothens and protects your hair fibers against humidity. 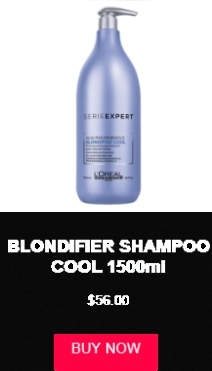 Luxuriously bathing your hair in hydration, polishing its surface and providing an effective humidity blocker. Shine is enhanced and control is regained. 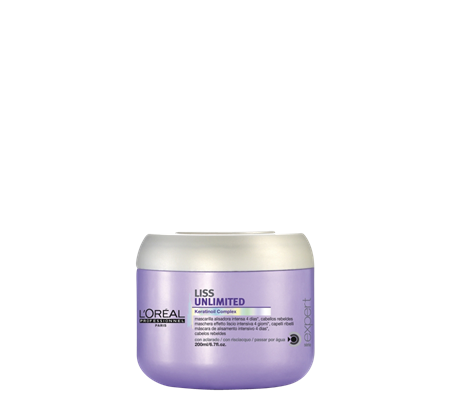 Click here to find out more about LISS UNLIMITED Masque on the Official L’Oreal Professionnel Website. Only your hairdresser can give your rebellious hair the right amount of nourishment and Pro-Keratin, to help discipline your hair for 4 days*. 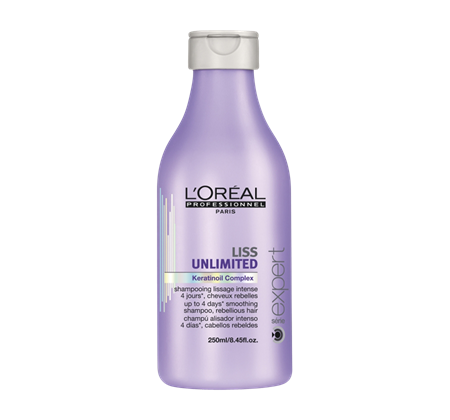 Discover the Liss Unlimited Shampoo by exclusively in L’Oréal Professionnel salons. *Instrumental test: shampoo + conditioner / masque + leave-in vs. classic shampoo. 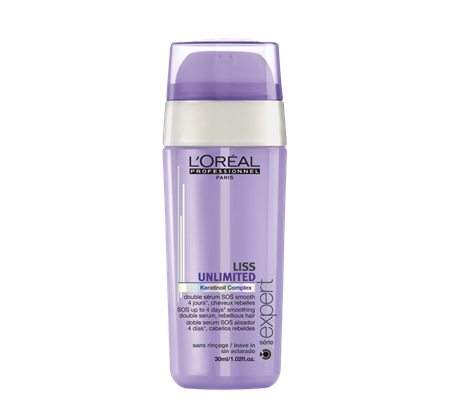 Click here to find out more about LISS UNLIMITED Shampoo on the Official L’Oreal Professionnel Website.